Grade with ease! 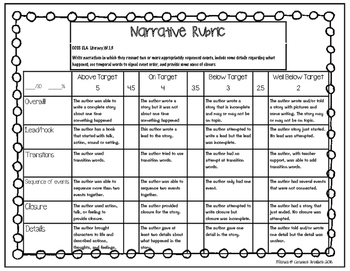 This rubric, which can be used for personal or realistic fiction narratives, will help you grade student stories with ease! This rubric is very specific and contains each component for what the common core standards says a narrative should have. This rubric is based on the first grade CCSS, however, it can be used for differentiation when grading in kindergarten or second grade.